I was speaking with a new customer the other day and he wanted to add some fixtures to his showroom floor. This client hadn’t used many fixtures in the past, but they wanted to improve the merchandising and display of products in their showroom. Their current fixtures were old, didn’t look very modern or clean, and gave a bad first impression to their shoppers. I worked up a quote for some new shelving that would make the improvements he was looking for and would best suit his retail space (giving him a very good price, of course!) and emailed it to him for review and approval. When I followed up with my customer he told me that he and his partners thought the price was more then they wanted to spend, and that they had decided to buy used fixtures in order to save money. Price is obviously a common area of concern in almost any purchasing decision, and it is a reasonable criteria to consider for any investment in retail store fixtures, so I wasn’t surprised when I heard this feedback. When weighing the option to buy new or used shelving, the first thing you might think of is how much money you might save by purchasing cheaper used fixtures — until you step back and really consider all the important factors. Buying used store shelving will initially appear to be cheaper because it is presented as a lower price per fixture, but in the long run you will not be happy if the fixtures don’t help you meet your important goals. In the case of this particular client, they wanted to make a better impression on their shoppers. Used store fixtures would be hard pressed to meet this standard. Used shelving usually translates to old shelving. 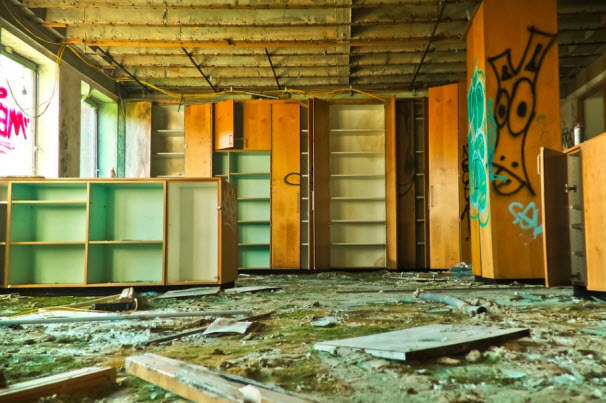 A majority of used shelving is purchased from stores that are going out of business. They may have been using shelving (which they likely purchased new) for decades. Over the years the paint has become chipped, shelving and uprights have become dented, backing has become torn and punctured, there could be stains from product spills which went untreated, sticker and label residue from years of pricing and signage changes, parts that went missing or haphazard repairs made to the fixtures during their ownership by one (and sometimes several) previous owners. All that plus the fact some brands and styles may have been discontinued; you may not be able to get compatible parts and accessories you’ll need to repair and replace elements on these fixtures in order to present them in a more favorable light. All the factors below can cost you money and time! Will you be happy with the condition of the fixtures? New fixtures are, well… NEW! You can expect them to look great, include all the required parts, and have a clean finish devoid of dents or blemishes. Used (old) fixtures are kind of a grab bag. You never really know what to expect when they actually show up. Are assembly instructions included? Are the parts labeled? New fixtures come marked and with manufacturer instructions. Used fixtures rarely have any original paperwork, and many times you won’t even be able to identify the manufacturer. Can you order more of the same fixture for adding more merchandising, replacing parts, or if the used shelving arrives damaged? New fixtures provide for greater and more reliable availability. They are more often in stock or in production, and can be more quickly shipped to your dock. Used fixtures are limited by what is available now and what might become available in the future. There’s no guarantee of stock, inventory, compatibility, color matching, etc. It’s the luck of the draw. Are the fixtures under warranty or include a replacement guarantee? Does the company you purchase the used shelving from stand behind their product? When you purchase new fixtures from Midwest Retail Services, we are with you as a partner — before and after the sale! Many used fixtures are sold as-is, without any guarantees or warranties from the seller or the manufacturer… Used fixture buyers beware! After hearing all these caveats and areas of concern surrounding used fixtures, you might be wondering what my customers decided to do. I am happy to say they chose to invest in new store fixtures and have not regretted it for a second. As a matter of fact, I am hoping to update the rest of their showrooms with new fixtures very soon! Chris Bell is a Sales Representative with Midwest Retail Services, specializing in assisting clients in every retail category with Display Fixtures and Fulfillment, Store Layout, Custom Design Fixtures, and Multi-Store Roll-Out Programs. Email Chris at cbell@mw-rs.com or call our offices at 800-576-7577 and ask for extension #224. This entry was posted in Ask The Team, Selecting Your Display Fixtures, Store Fixture Services, Top Shelf Experts and tagged ask the team, Convenience Store Shelving, Customer Experience, Display Fixtures and Shelving, expert advice, Gondola Shelving, Grocery Store Shelving, Problem-Solving, Retail Display Tips, Retail fixture, Retail Store Shelving, Shopping Experience, Small Business, Store Shelving, Tips I Can Use by Midwest Retail Services. Bookmark the permalink. Next → Next post: What can I do if my store fixtures arrive damaged? Ask The Team!